Contacts details of 6000 Major Companies in Nigeria. Include address, phone numbers, emails, management, contacts persons and many more. Available in Soft Copy (www.6000Profiles.com - Download - CD ROM). 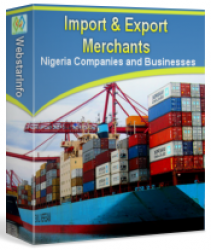 Contact details of companies engaged in or providing services in import & export business in Nigeria. Include address, phone numbers, emails, management, contacts persons and many more. Available in Excel soft copy (Download & CD ROM). Contact details of manufacturing companies in Nigeria. Include address, phone numbers, emails, management, contacts persons and many more. Available in Excel soft copy (Download and CD ROM). Contact details of 50,000 Companies with significant market share in various sectors in Nigeria. Include address, phone numbers, emails, management, contacts persons and many more. Available in Excel soft copy (Download and CD ROM). Webstar Information Services Ltd. (WebstarInfo) is an information and web marketing solutions provider. We aim to become the leading source of information regarding the Nigeria's vast population and businesses. This we hope to achieve by creating useful information resource needed to aid marketing, business and research. Our products and services are used by both companies, educational institutions, government agencies and other organization within and outside Nigeria. We do custom research for companies like market survey and specialized information gathering. We also collect and update information about companies in Nigeria from which we are building a database that will contain contact information and profiles of over one million companies in Nigeria.